This is one of only two specimens known from a small find of 2014, at a small pegmatite outcrop that turned up about 120 km north of the original type locality, across a small river near the local town. 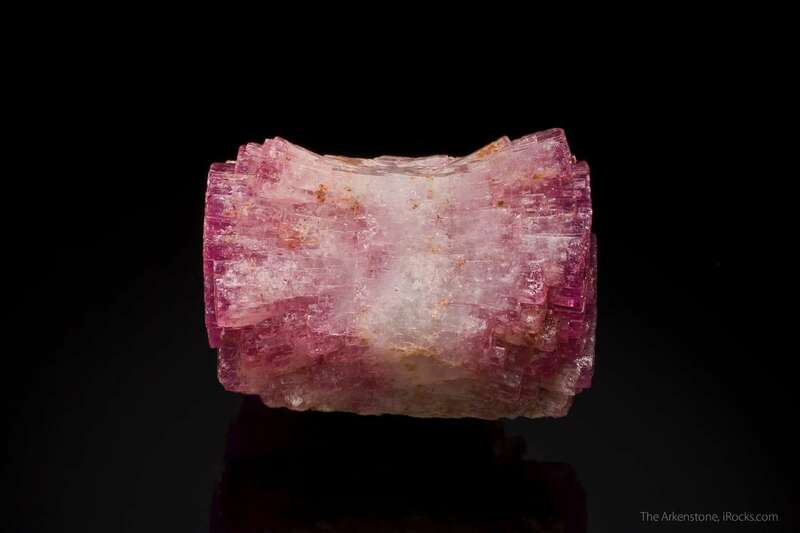 The piece showed up with a gemstone rough dealer, instead of through the usual channels for minerals. It is a doubly-terminated crystal with a unique "barrel & bowtie" form, for lack of any other way to describe its bizarre habit. It was confirmed by Federico Pezzotta for me, as a true pezzotaite specimen. I am told that, to this day, it remains the only pocket found there (of which essentially this one piece was quite literally the pocket contents). The photo speaks for itself - a highly unusual beryl! Joe Budd photos. From Pezzotta: "yes, I remember this specimen very well. This is from a unique discovery at the Tokambohitra mine, in the Sahatany valley, a totally new locality for Pezzottaite. Unfortunately only two nice specimens were collected at the place. The one you already got (which is the best one) and the one I have which is in any cases nice."